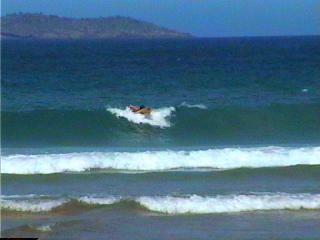 After so much searching we finally found some good wave riding. 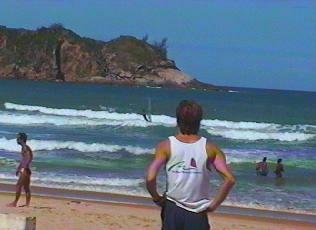 Everyone in Rio had told us that we needed to go to Buzios to find some really good windsurfing ..... and they were right -- well, almost. Once again, no good equipment, and also the winds were still pretty light compared to what we are used to. The beach, however, was awesome. Hans is wearing his Maui Windsurfing Company shirt just praying for any conditions similiar to our favorite spot to windsurf in Maui. The guy windsurfing in this picture actually rents boards. 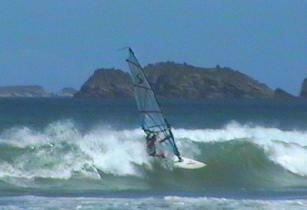 He owns the only windsurf school in Buzios. The boards are very old and beat up and his shop is on the other side - on the bay side. He likes to surf more than run a business. So, basically there was no wave sailing for Hans. We did go on the bay side for a day but the winds were very light. Tiffany was having alot of fun until she spoke with a local windsurfer who told us about his friend who got bitten by a 4 meter white shark in the bay. Hmmmmm, White, heh?? Like in Rio, Hans did lot's of body surfing. 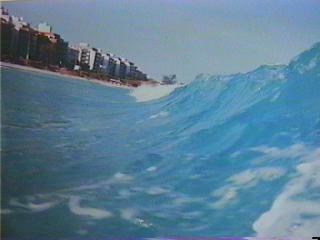 This picture he took with a water camera in Cabo Frio, which is near Buzios, while catching a wave. Since windsurfing wasn't happening he decided it was time to try regular surfing. Hey, it'll help him wave sail - right guys? So he borrowed the biggest board he could find and headed out there. Note the lack of any wet suit or other items of clothing needed to keep him warm. You got to love warm water even though by Brazillian standards Buzios and Cabo Frio are famous for their coldwater - so everyone kept telling us. Brazillians are clueless to real cold, lucky them. We would like to see them take a dip in our freezing bay waters. Notice how you don't see any shots of Hans standing up. We could make up some excuse about how it was Tiffany's poor camera work but the truth is that he did not stand up. That's changed since then. He has bought a board and is trying to get as much surfing in as possible. Hopefully he can keep it up back in the Bay Area. !